If you’re on the cusp of Overwatch League fandom, or just want to spend the weekend in Brooklyn shouting about a Philadelphia sports team being better than another sports team, this is your chance. Philadelphia’s tremendous sports year has stretched into the summer in a couple unexpected ways: The Phillies lead the NL East, and the newest addition, the Fusion, are one step away from being crowned champions. The last time we checked in on the Philadelphia Fusion, the city’s Overwatch League team, they were wearing Underdog masks and preparing to face the Boston Uprising in a quarterfinal matchup. For Philly sports fans, it caused a little bit of pleasant deja vu. Now, with upset victories over Boston and the New York Excelsior in the rearview, the Fusion are headed to Brooklyn to face the London Spitfire in the OWL’s grand finals. Because the OWL plays its regular season in California, this is the closest the Fusion have ever been to Philadelphia for a match. If you’re on the cusp of Overwatch League fandom, or just want to spend the weekend in Brooklyn shouting about a Philadelphia sports team being better than another sports team, this is your chance: The Fusion are offering a free shuttle to the Barclays Center in Brooklyn for fans who sign up by Wednesday evening. We’re shipping up to New York! 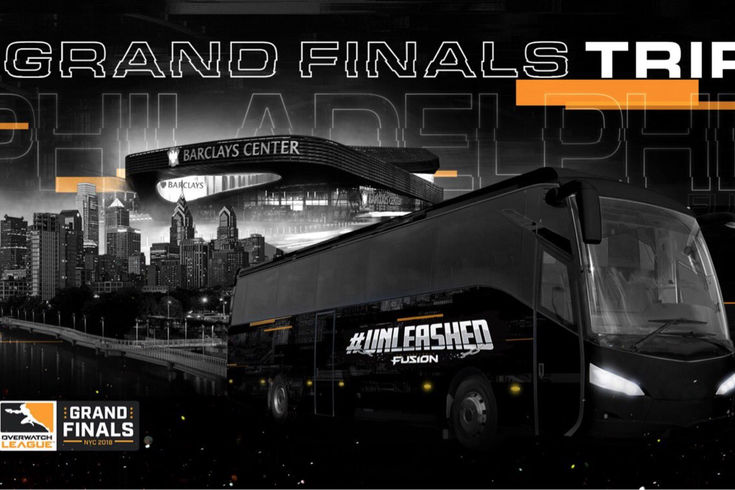 Have tickets to the finals and need a lift from Philly? Sign up for our FREE shuttle (running Friday and Saturday) on the form below! Make sure to read the rules and complete the form by July 25 at 5PM EDT! There are Grand Finals matches on Friday and Saturday, so you have two options when you sign up. You’ll need to have purchased tickets to the Grand Finals already in order to be eligible for the shuttle. One interesting tidbit to spark the interest of more traditional Philly sports fans: Hunter Pence, the next great Phillie, is a fan of and investor in Cloud 9, the gaming group behind the London Spitfire. If you can’t make it to Brooklyn to watch in person, you can watch the matches on ESPN — seriously! — on ESPN at 7 p.m. Friday, and on ESPN2 at 9 p.m. Saturday.